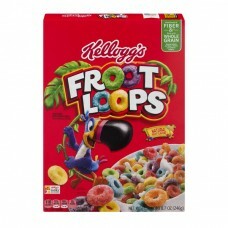 Kellogg's® Froot Loops® Sweetened Multi-Grain Cereal. Good source of fiber & made with whole grain. Natural fruit flavors. 110 calories. 0.5g sat fat, 3% DV. 150mg sodium, 6% DV. 10g sugars. Per 1 cup serving. Net wt 8.7 oz (246g). Proud sponsor. Whole Grain™. 11g or more per serving. Eat 48g or more of whole grains daily. wholegrainscouncil.org. Paper, box. Recycled if clean & dry, store drop-off, plastic, bag. how2recycle.info. Certified 100% Recycled Paperboard®. Questions or comments? Provide production code on package. Call 1-800-962-1413. Visit kelloggs.com. ®, TM, ©2017 Kellogg NA Co.